Our goal is two fold; we want to be able to deliver a professional looking website that shows our current buy and sell prices for our products and we also want a physical presence in the form of an actual store location. From our buying experiences, we always feel more comfortable buying from a company that has an actual store location instead of a company that is strictly internet based and only has a mailing address. Working from three retail locations and a busy e-commerce site offering national and international delivery, Liberty Metals Group sells both physical metals and metals-based products such as precious metals IRAs. Operating online and from stores in San Diego, CA and Scottsdale, AZ – Liberty Metals Group is one of the largest dealers of Gold, Silver, Platinum and Palladium in the Southwestern United States. The formation of Liberty Metals Group by Mark and Janet Lonneker was a natural progression after several years of buying gold and silver. With customer satisfaction a number one priority Liberty Metals Group offers a personal service in their three stores located in California and Arizona as well as an up to date e-commerce website. When doing business with Liberty Metals Group - please say you saw them in Bullion.Directory. 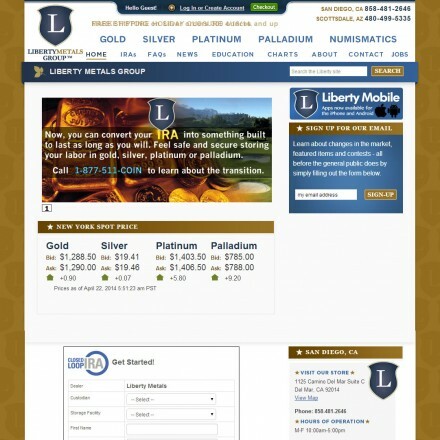 Read or add Liberty Metals Group reviews and ratings using the "reviews" tab above. All Liberty Metals Group details are believed to be correct at the time of listing. Please report errors here. I don’t doubt what others are saying, but those have not been my experience. I’ve placed a half dozen orders from 2012-2015 totaling nearly $50,000, and I always got great service. The sales people were always helpful, their prices were better than most other dealers, and shipping was fast. I usually got my orders within a couple of weeks (although I seem to remember one being slightly delayed, but I think I got it in about four weeks), and that includes mailing time as I paid by money order. Liberty Metals Group took $9,400 for silver eagle coins order on 7/2014, and failed to deliver product as promised. After a year of deceit and broken promises, we filed a civil suit for Breach of Contract and were awarded a Default Judgement. They will not respond to any communications (mail, phone, email) and we are now in process of sending them to collections. They have multiple judgements against them and appear to be in hiding. Our lawyer has recommended if they don’t pay that we next file a criminal suit for fraud as they took money with no intent/ability to deliver the goods. May as well have been robbed. Cannot stress enough, DO NOT DO BUSINESS WITH.